On Blu-ray and DVD for the first time in the U.S. The film is narrated by Dr. Guilbert (Henri Vidal), who has just returned home to his bombed-out apartment in the French town of Royan. Meanwhile, at the other corner of Europe, a small group of Nazis are sailing out of Oslo on a U-boat. Herr Forster (Jo Dest) is the senior party official — not only the eldest, but the most high-ranking and the most completely loyal to the Nazi ideology. There is a military general aboard, along with his mistress Hilda, and, awkwardly, her husband. Forster has brought along his own partner, a young man named Willy (Michel Auclair). There’s also the nervous-looking Couturier (Paul Bernard) who wrote propaganda for Germany during the war. Finally, there is a Scandinavian girl of 17 traveling with her father, whose importance to the cause remains unspecific. If Germany should fall, these brave few will be charged with building a Nazi culture in South America to carry on Hitler’s work. An injury on board provides the film’s justification for including the French doctor. Willy, Couturier (who speaks French), and another man go ashore as they sail past Royan and quickly find the town’s doctor. They kidnap Dr. Guilbert and bring him on board. His entrance into the submarine is the most remarkable shot in the film. He walks toward the camera the entire length of the crowded sub, passing dozens of sailors working or resting. The DVD’s extra features reveal this was an elaborate set and a challenging shot for a director who loved technical challenges. Dr. Guilbert is the central character, but the movie doesn’t exclusively follow him, perhaps to the film’s detriment. The other characters are interesting in their tension and mistrust, but sometimes it’s hard to know who exactly we’re supposed to be watching. The film begins and ends with the doctor, but sometimes he’s absent from a scene. In fact, two prominent examples are the two stops that the sub makes before the end — once at a black-market supplier who had worked with the Nazis during the war, and another time at a refueling ship at sea. The supplier, Larga, is played by the actor who gets top billing,	Marcel Dalio. If you listen to the audio commentary you’ll hear that Dalio was a Jew forced to flee Europe during the war. Like so many Jews (according to the audio commentary), Dalio ironically played Germans or Nazis in World War II films that were made after the war. As interesting as the parts are that make up The Damned, it never coheres into a single, great film. The doctor at one point ends up alone on the U-boat, which could be the premise for another great film. But like so many of the other good scenes, it isn’t used as a foundation for further development. It’s just another good scene in a movie of many parts. 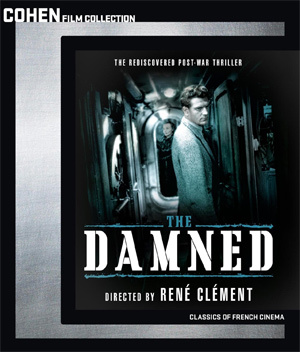 This is the first digital release of The Damned in the U.S. Thanks to the Cohen Media Group for releasing the Blu-ray and DVD. I’m not sure I’ve partaken of their library before, but it looks pretty good. The Coming Soon section of the disc shows Blancanieves, The Attack, In the House, and a lesser known film from Jean-Pierre Melville. There are two substantial extra features on the Blu-ray: an audio commentary with two film professors from Ohio State University, and an hour-long documentary on Clément from Dominique Maillet. The weaker feature is the audio commentary. Judith Mayne and John E. Davidson let silence dominate as they watch along with us. Rarely do they have anything to add that isn’t already on the screen. Occasionally they’ll call out a subtle detail (a clown mask hangs in many scenes) or a character trait (the doctor is surprisingly commanding, considering he’s a prisoner). But mostly what they have to offer is ... silence. I allowed myself to skim the commentary after 20 minutes of frustration. Only once did I hear a comment that suggested some outside expertise. Mayne mentioned the actor Marcel Dalio’s history (mentioned above), and I hoped the commentary was picking up. But after that, the slow slog set in again for the duration. The documentary, called René Clément, or, The Cinema of Sketches, is stronger, but only by comparison. It’s a broad overview of the director’s career. It tells us that Clément directed films before the New Wave washed over France, and when it did, directors like Clément were washed away as too commercial. It tells us that Clément was a technician who liked to solve tricky problems, and that he wasn’t afraid to let his characters be morally ambiguous. It tells us he was a control freak, of sorts, through interviews with people who worked with him. What I felt the documentary lacked, however, was illustrative footage from Clément’s own films. The documentary mentions a film called “Battle of the Rails,” several times, but never shows us what it was about. For me, I admire Clément’s Purple Noon, and even moreso, his other World War II masterpiece, Forbidden Games. But that’s for another day and another review. The film was “remastered” in HD for this release. The Blu-ray makes it look good enough, considering its age. It’s by no means a pristine copy. Some scenes show slight instability. Others show subtle strobing in the dark areas. And some scenes just seem to come from cleaner prints than others. Don’t get me wrong, The Damned looks good. But you won’t be surprised to discover that it’s a 65-year-old film. Watch the feature film first. If you like what you see, or if you’re a fan of Clément’s, watch the documentary. Skip the audio commentary.